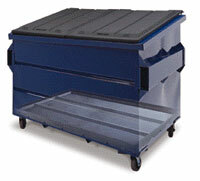 The Container 3000 is a low-maintenance front-load container uniquely designed for durability. It features the Roto-Bottom, made of tough, crosslink or linear polyethylene plastic. Replace old, rusted bin bottoms with a Roto-Bottom for a long-lasting solution to your maintenance problems. The Roto-Bottom is rotationally molded from tough Crosslink or Linear Polyethylene Resin. Its unique design makes it strong; the Roto-Bottom is test-proven for over 1,000 lbs. Ideal for Restaurants, Hospitals, Schools, Equestrian, etc. The Roto-Bottom is welded to the inner container wall for a snug, secure installation. Full installation instructions may be please requested with your order - call Roto Customer Service for details. Roto Industries, Inc., 1251 N. Jefferson St., Anaheim, CA 92807. Tel: 714-630-0272; Fax: 714-630-6726.